Fishing Charters in Torquay, Paignton and Brixham, Devon. Mackerel fishing, day trips, deep wreck fishing and wildlife excursions. 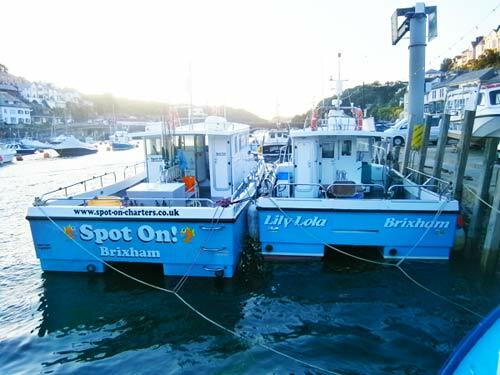 There is an abundance of fishing charters in Torquay, Paignton and Brixham offering mackerel fishing trips, wildlife excursions and deep wreck fishing in and around Torbay. Here is a list for some of the ones I know of. If you need me to add or update any of the details here please contact me. There are no charges for putting your business on this page! PLEASE DON'T CONTACT ME FOR CHARTERS! I do NOT own, nor have any type of charter company. Mention "Torbay Fishing" when booking! 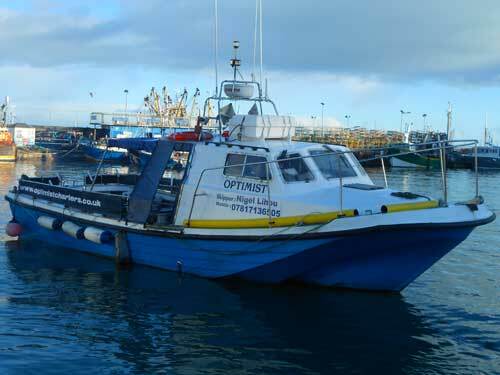 Funfish Trips are a family run business based in Brixham . They are predominantly a fishing family by trade and between them have over 100 years of experience in the fishing industry. Their inshore trawlers were traded in years ago and the family began sharing this experience with others through the pleasure boat industry. Want to know what it's really like on-board? I took my two daughters on a trip with them and wrote about the great day out here. They offer everything from 2 hour inshore mackerel fishing trips to 4hr, 8hr or 10hr rough ground, or wreck fishing trips (all gear supplied). They have trips perfect for first time fishers, families, couple's or for the most seasoned of anglers! Silver Halo is now Torbay's newest charter boat, newly built in 2017-18 she is a sporty 8m Cheetah Marina Catamaran. When conditions allow, we cruise at an amazing 20-22 knots and top speed is just over 30 knots, ideal for travelling long distances quickly, opening up more options and providing more fishing time! Based in Torquay Marina we specialise in top quality, small group fishing trips but also offer, a wide range of other options to give everyone the chance to get out to sea. We only take a maximum of six clients so it's perfect for families or groups of friends to have a private complete boat charter. This way we can tailor the day to to your exact needs. Whether it’s fishing, sightseeing, or a cruise to explore the coast and estuaries, we'd love to help and can offer a great range of options to suit all budgets and tastes. You can charter the complete boat or pay per head, please see our main website for all the details and to make a booking online. The newest state of the art Catamaran on the market to date and the newest vessel in Torbay and surrounding areas. Twin engine reliability and 630hp means Spot On is the fastest charter boat in the south west UK. Undercover area and seating for all on board. Hot drinks and oven to warm pies & pasties etc on board. Fully Licensed and Insured to COP Cat 2 (60 miles) for 12 Passengers plus 2 Crew. Optimist Charters offers a variety of Fishing trips from 2 hours Mackerel fishing to half and full day Wreck, reef or Bank fishing to 3, 4 or 5 day Channel Island Trips. Wildlife Watching: - Offering a variety of trips in Torbay and the surrounding area and can, if so required, employ the services of a local wildlife guide, whose knowledge can enhance your trip. 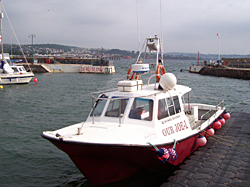 Optimist charters are based in Brixham. 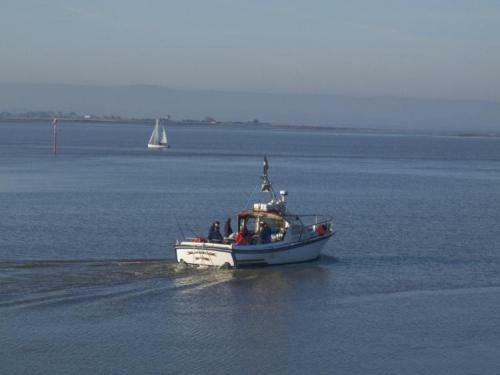 They have a wide selection of wrecks, reefs and sandbanks, within an hour's steaming and can fish mid channel. They also have strong links in the channel Islands meaning they can also offer 3, 4 or 5 day bookings where you can fish the reefs and banks around Guernsey and Alderney. They can operate out of their home port Brixham or can pick you up in Paignton, Torquay or Dartmouth and Tide permitting Babbacombe or Teignmouth. Fishing out of Paignton, Devon we have access to a wide variety of wrecks for Pollock, Cod, Ling, Bass and Conger and reefs for Conger, Bass, Whiting and Dogfish. Also the Skerries Banks for Plaice, Dabs, Ray and just maybe a Turbot. As well as all of these we also catch Gurnard, Wrasse and various types of Bream. 335 HP Cummins powered 'Lochin 33'. Fitted out with a WC and onboard galley, tea and coffee supplied as and when required, with an over for warming up food. Trip length 2, 4, 6 or 8 hours licensed for 10 passengers. + 2 Crew. You can email me at: simondayuk@gmail.com if you spot any problems or you would like to see anything else on this site.